Buying a new car is one of the single biggest purchases you'll make in your lifetime, and it's natural to feel a bit overwhelmed or even confused about the details. The good news is that buying a new car doesn't have to be overwhelming or confusing; there is more information available than ever before and if you use it to your advantage, the process isn't so scary. Forget about sneaking off to the lots on your lunch break or having to compete for help on the weekends. 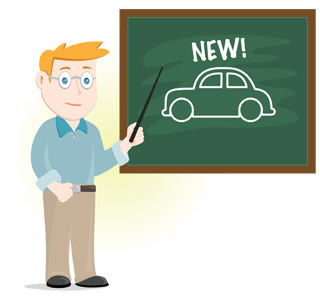 Forget about feeling intimidated by the dealer and let NewCars.com help you join the online car buying revolution. Our informative How to Buy a New Car series has helpful tools and resources that will help you get through the new car buying process without the new car buying headache. The car buying process has evolved a lot in recent years, due in large part to the growth of the Internet. Fewer people are going into the dealerships uninformed, because they are figuring out how to buy a car quicker and easier by doing research and gaining knowledge from websites like NewCars.com. Our new car buying guide provides the buying tips and information you need to help save you money. Our series also tackles car buying dilemmas like deciding between a loan or a lease, dealing with your trade in, and negotiating with the dealer, just to name a few. Some sections have fun and useful videos that explain the topic in greater detail. When you're done doing your research, get started by finding your desired car and requesting a free, no-obligation Internet price quote that will begin your hassle-free negotiation with the dealer. Your new car is out there and we're here to help you find it!